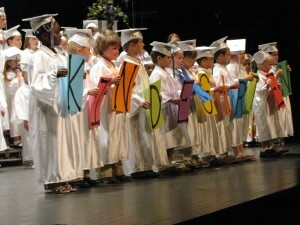 The Roger Bacon Academy’s Charter Day School held the commencement ceremony of the Kindergarten Class of 2011 on Wednesday, June 8, 2011 at ten o’clock in the morning at the University of North Carolina at Wilmington’s Kenan Auditorium. 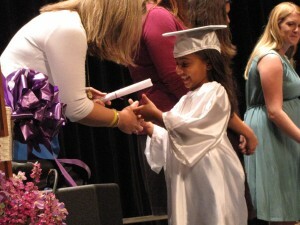 Proud parents, students, faculty and staff took time to honor the accomplishments of these graduates. Jennifer Beamer, Principal officiated the event and was joined on stage by Superintendent Mark Cramer. 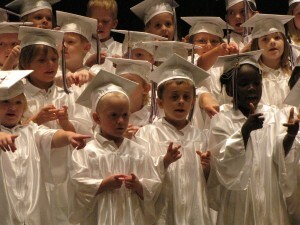 Highlights included performances of songs by the Kindergarten class and a video highlighting their year and future hopes (Play VIDEO Here). We are proud of all the graduates of the Charer Day School Kindergarten class and wish them all the best life has to offer in their bright futures.